With these words, written by the New York State Legislature in 1885, the Adirondack Forest Preserve was born. 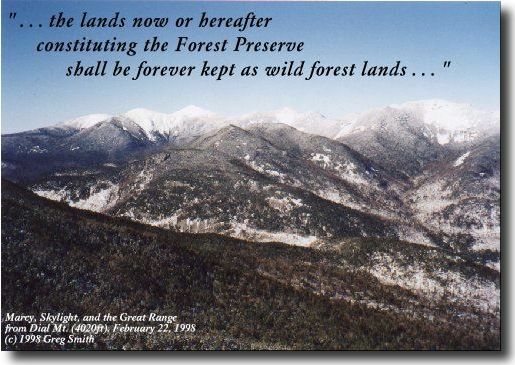 Nine years later, the Adirondacks became the first and only wild land preserve in the United States to gain constitutional protection when New York's voters approved the inclusion of Article VII, Section 7, the "forever wild" clause, into the state Constitution. Today, at 6 million acres and larger than Yellowstone, Yosemite, Grand Canyon, Great Smoky, and Everglades National Parks combined, the Adirondack Park and Forest Preserve is the largest park in the nation outside of Alaska. In the pages that follow we will explore the people, places, sights, and history that make the Adirondack region one of the most unique in the world. Please use the links to the left to navigate, and enjoy your visit!! For best results, please be sure your screen resolution is set to at least 800x600 at 16-bit color. Some pages may not appear correctly at lower resolutions, and the photos will look far better at higher color! Important news to High Peaks users: As of April 1, 2000, the High Peaks Unit Management Plan is in effect. A summary of the changes is available. 5/8/00: I apologize for the two-day outage of the site. While enjoying a weekend kayaking on the Bog River, the server decided it didn't want to be connected to the Internet anymore. 4/12/00: Improved way of navigating through the Lakes section. 4/8/00: Added pages describing the High Peaks Unit Management Plan and DEC pond reclamation efforts to the Current Issues section. Linked the Adirondack Lakes section directly to the links frame at left, and added a couple new lakes. Added a couple new peaks to, and an easier way to navigate through, the Peaks section. 4/5/00: News page converted into a Current Issues section, and two pages discussing river access rights are added to that section. Click the link for details. Also, several photos added around the site. 4/3/00: Added photos of the McIntyre Iron Works. Added a number of other photos to the Peaks and the Miscellaneous Photos sections as well. 3/31/00: Added a history of the Adirondack Park Agency to the Political History section. 3/11/00: Added some more pictures to the peaks page, and added a page on the B-47 crash on Wright Peak of January, 1962, to the History section.